Rakanoth is a slow, powerful Melee Assassin, moving in very telegraphed motions. Despite this, he truly lives up to his title as "Lord of Despair", inflicting enemies with a mounting sense of dread, causing hesitation in his presence. Killing nearby enemy minions = 3 Despair to nearby enemy heroes. Killing nearby enemy mercenaries(captured) = 6 Despair to nearby enemy heroes. Killing(/participating in takedowns of) nearby enemy heroes = 20 Despair to nearby enemy heroes, + 10 for every enemy hero dead at that time. Every 100(scaling) damage received from Rakanoth = 3 Despair to the appropriate hero. Despair builds up to 100 in all enemy heroes, and depletes at a rate of 4/s after 5 seconds out of combat with Rakanoth/being applied stacks of Despair, and also depletes at a rate of 20/s within an allied Hall of Storms. Despair has debilitating effects on enemies, depending on how much is currently built up on them. As Despair begins to build up in Rakanoth's enemies, they find themselves hesitant to attack. Enemies at 20+ Despair suffer a 15% reduction in Attack Speed. Despair continues to build, causing enemies to expose weaknesses they normally wouldn't. Enemies at 60+ Despair suffer a penalty of -15 to their armor. Despair nearly fills the target, causing it to hesitate even further. Enemies at 80+ Despair suffer a delay of 0.3 seconds before they actually cast their abilities. Despair begins to overwhelm the target. They suffer an additional 10% further attack speed and movement speed slow, the movement speed slow begins to apply always, and they apply a stack of Despair to all nearby allied heroes(their's, not Rakanoth's) every second. Rakanoth begins to ready a sweep, the direction of which is determined by a vector target; In the left 90°, they sweep from right to left, vice versa for the right 90°, and for the forward/back 90°, sweeps out from the center, hitting a longer, less wide area. Enemies hit by any of these sweeps take 340 damage, and are knocked to the appropriate side(away from the center for forward/back) ~2 units. All sweeps have a 0.5 second wind up time, and occur over 0.5 seconds. Being in Sweeping Despair's targeted area when it is cast inflicts 5 Despair to enemies, and being hit with the actual sweep inflicts 10 Despair. Rakanoth's mere presence begins to instill terror in nearby enemies. Enemies within range are applied 4 Despair per second. Enemies additionally take 10 damage per second for every tier of Despair they are under the effects of. Cooldown - 3 seconds on shutting off. Rakanoth prepares to teleport to target enemy hero, causing a mark to materialize over their head, similar to the Butcher's charge. Rakanoth channels this teleport for 1 second, before suddenly appearing at his target, at the direction he channeled from, inflicting 220 damage, increased by 100% if Rakanoth teleports to the target's back. Rakanoth can reactivate this ability while channeling to cancel it without teleporting, refunding 50% of the Mana and cooldown. Rakanoth inflicts 5 Despair to his teleport's mark target, and an additional 12 Despair to the target and half that to all enemies within 3 range of the target on actually teleporting. Rakanoth draws an arm back over 0.5 seconds, before thrusting with it in target direction. If an enemy is hit, they are impaled, taking 240 damage as Rakanoth unleashes a pulse of hellish magic into them. The enemy is rooted for 1 second, plus 0.25 seconds for every stage of Despair they are currently suffering from, including ones that are reached from Dread Prison. In addition, all Despair the target receives is increased by 100% while rooted and for 2 seconds after, altered to all Despair they give off at 100 Despair. Being hit with Dread Prison inflicts 20 Despair on the target. Rakanoth builds up hellish magic for 0.5 seconds, before entering a targeting state for up to 10 seconds. Rakanoth gets 5 Despair Bolts that he can fire by reactivating [R], each dealing damage and slowing in an area. Rakanoth can cancel this ability early by pressing [D], refunding 10 seconds of cooldown and 10 mana for each remaining Despair Bolt when doing so. Unleash a bolt of despair at target location within the range of Volley of Despair, dealing 140 damage to enemies hit, inflicting 6 Despair and slowing for 15%, stacking with Mounting Despair's slows. Cooldown(Between Charges) - 0.5 seconds. Lord of Blades - Rakanoth's basic attacks now apply 5 Despair naturally. ??? - Nearby enemies are inflicted with 5 Despair for every 100 damage Rakanoth takes. Active: Nearby enemies are greeted with a horrible screeching noise as Rakanoth drags his blades across one another over 1 second. Enemies within range to hear this noise are applied 4 Despair every 0.2 seconds. Impairing Sweep - Enemies hit by Sweeping Despair are slowed by 15% for 2 seconds. Overpowering Dread - Enemy minions within range of Aura of Dread take 50 damage per second. Shattering Blow - Enemy heroes that are hit by Teleport Charge lose 10 armor, increased to 20 armor when hit from behind, for 3 seconds. ??? - Enemy heroes deal 5% less damage for every stage of Despair they are suffering from. Dread Armor - Every time an enemy hero enters a higher stage of Despair, Rakanoth gains 10 Armor, stacking up to 4 times. Stacks all refresh when another is gained. Stacks vanish after 5 seconds without gaining another. Feast Upon Despair - Whenever Rakanoth participates in the takedown of an enemy hero, he heals for 10% of his missing health per stage of Despair they were suffering from. Crippling Dread - Rakanoth now applies a 5% slow to enemy Heroes per stage of Despair they are suffering from. Dread Prison - See 'R1' above. Volley of Despair - See 'R2' above. ??? - Enemy Heroes lose 10% vision range and 20% of all Allied Vision per stage of Despair they are suffering from. ??? - Rakanoth's basic attacks hit all targets within range 1.5 of his primary target for 40% damage. Powerful Sweep - Sweeping Despair moves enemies hit an additional 1.5 units. If this causes them to colide with terrain, they take an additional 100 damage, and are stunned for 0.75 seconds. Dread Lord - Whenever an enemy hero enters a later stage of Despair within range 10 of Rakanoth, Rakanoth gains a decaying boost of 25% to his movement speed for 3 seconds, and all of his basic ability cooldowns are reduced by 3 seconds. Blades of Despair - Rakanoth's attack speed is increased by 25%, and an additional 2.5% for every stage of Despair enemies are suffering from within range 10. Dread Nova - Teleport Charge deals 120 damage to all targets hit with the secondary dread application, increased by 50% when the primary target was hit from behind. Creeping Dread - Dread Prison is extended by 0.25 seconds each time the afflicted enemy enters a later stage of Despair while under its effects. Additionally, if the target reaches 100 Despair under the effects of Dread Prison, it spreads to all enemy heroes within range 5, rooting them as if they were hit with the initial cast of Dread Prison but dealing 0 damage. Targets besides the primary target hit do not spread Dread Prison further. Tide of Despair - Every time an enemy enters a later stage of Despair during Volley of Despair, its duration is extended by 2 seconds, and Rakanoth gains an additional charge of Despair Bolt. 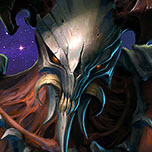 Dreadforce - Rakanoth's allies now spread Despair to enemy heroes when fulfilling conditions present in Rakanoth's trait. Absolute Despair - Rakanoth applies 100% of the Despair he generates with his basic abilities to all enemies within range 4 of whoever they hit. Ra'Kanoth is a sadistic individual, even by Tal'darim standards, going to much longer lengths than most to truly inflict suffering in his opponents before killing them, even designing his unique headpiece around this ideal of spreading despair in his foes. Ra'Kanoth presently competes for the Highlord's favor with First Ascendant ??? (suggestion for which hero fits appreciated... (^_^')), long awaiting his time to break them in body and spirit before rising to First Ascendant. Themed Abilities - Rakanoth's blades are not quite as large, causing his [Q] - Sweeping Despair to utilize a red psionic shockwave, though distinct still from Alarak's. His [W] - Aura of Dread causes the affected area to crackle with this same red psionic energy, and his [E] - Teleport Charge now marks the target with a modified Tal'Darim faction symbol. [R] - Dread Prison imprisons the foe with similar energy, while [R] - Volley of Despair is arcing bolts of similar energy. Screeching Terror is modified to a more energy-on-energy sound instead of screeching metal. Altered Voiceover - While still bearing modulation, the modulation is adjusted from its normal state to that more befitting a Protoss. Altered Animations - While mostly similar to normal, they are overall adjusted to better fit his somewhat altered frame. Alternate Tints - Daelaam, Nerazim, Purifier as some possible. Others include the White/Gold, Purple, or Jade of Alarak's tints. 9/8/2018 - Added faster Despair depletion clause within an allied Hall of Storms. 9/22/2018 - Added Tal'Darim skin, fixed Heroesfire link, added base hero stats(whoops). Despair applications near universally buffed; Minion kills are now 3(from 2), Captured Mercs are now 6(from 4), Takedowns are now 25(from 20) base, and damage amounts are now 3(from 2). Sweeping Despair is now 5 Cast/10 Hit(from 4/6), Aura is now always 4(from 3+1 at 40), Teleport Charge is now 5/12(from 4/8), Dread Prison is now 20(from 15), and Volley is now 6(from 5). ??? at T1 also was buffed to 5(from 2). 100 Despair applications are now 2 per second(from 1). Crippling Dread added at T3. ??? (T5-2) now functions better with Lord of Blades. Blades of Despair now actually exist; % speed buff is now 2.5%(from 1%). Active functionality of the Trait removed. Despair stages tweaked; Now only 4 stages every 25 Despair, resulting in the loss of a baseline slow as part of it(at least some slows that worked with it have been updated to normal text). K so straight up this was a good name choice since Rakanoth is a big name just under the big 7 and mentioned in the end times, i like how you caught his Despair traits and managed to create a whole unique kit around it and works quite good. His design does rather fit a debuffing assassin type role that is reliant on his Despair > auto attacking but i will say his 20 and 40 Despairs might be slightly too high and might be good to make those numbers talent related but not a big issue there. Do i really need to say much more here that creativity didn't already? he's the Lord of Despair and its his whole theme here xP. He feels rather fun to play when trying to instil Despair into the enemy though might be a pain when viewing this from the opposing team, not much to say here since he seems fairly well built. Top job on the concept mate, Rakanoth was one of my first concepts myself :D yours is much much better then mine though. Oh, yeah. Numbers are always a "Decent ballpark estimate". Very guilty of over and under tuning, so.. Honestly, with present numbers, I think Rakanoth's Despair (Edit: application*) cap may be low if he hits everything in his base kit, but that's 100% opinion. Over 5 seconds, he hits ~63 Despair on a single enemy if he hits with 100% of his level one applications, which I figure is either maybe a little under or about par for base. Overall, thanks for the kind words! I'm looking forwards to designing some fun talents for this theme(and looking forward a bit less to being unable to read despair as a word again). Talents have been uploaded, and as usual, I struggle to name some of them. The character is actually quite interesting! While many people have suggested the idea of stacking an effect on all enemies with negative effects on them over time, I am actually quite interested in the idea you’ve made, though there are some things I find concerning. First things first, several of the abilities seems sufficiently unique, though some are not the most interesting, with a self-centered area effect, a point and click teleport, and a short range Telekinesis. I think they work with different visuals, however. I do take an issue with the activation effect of his trait; it feels unneeded. Unlike Yrel, who cannot exist without her instant casts, Rakanoth can survive just fine without it, and since you only have two abilities to choice between, it's not that interesting. It also adds way too much to your trait, which is already overfilled. I would suggest making the effects occur at every 25 Despair, so as to limit the number of effects and levels. This will require some balancing of talents. Several of his talents seem a bit uninspired, namely Tier 2, but I enjoy some of the others. The character flows very well together at its core, with every effect working together to create a very clear style of play all built upon applying Despair. Teleporting in with your aura and keeping them in with your Q makes for a solid combo, and it's only capitalized by your heroics. I do have a couple concerns, however. First thing first, I am not a fan that the Rakanoth will likely never reach Despair’s maximum often in his play. The time it takes to stack up Despair is completely unrealistic, unless you plan on killing the entire enemy team. In that case, it seems a mute passive. I think his abilities should give a lot more Despair, and one of the effects should be removed to bring it in line. It feels like the character is never really being at its full power, a bad feeling all in all. The talents are set up in a mostly nice way, but some talents feel like they miss the mark, or feel a bit… wonky. Screeching Terror seems incredibly useful with its moderate range and strong effect. Since you are really going to be using your combo once every 20 seconds anyways, it seems like a really appealing choice. Most talents that work exclusively off of enemies reaching a new Despair level feel unreliable with the way Despair gain is now. Blades of Despair feel like the bonus effect is a joke. If you happen to get every enemy hero to max Despair (a literally impossible task), you get a 25% bonus. I’m really not sure this was thought through. I love the thematic pulled into the design here! The surety the delays presents works well with the despair mechanic you have interwoven. I also love how his two heroics present a melee vs ranged divide, a theme that also works well with the character. All in all, it fits the character well. Ignoring the instant activation effect of his trait, the character is actually extremely interactive. Every ability has a delay or an effect dependant on positioning over time, making missing and not maximizing your Despair a serious fault in his power. And if you have a large amount of Despair, you can simply disengage and let your Despair fall back to normal. Even your single target teleport has a channel duration, allowing enemies to prepare for your arrival, or interrupt it with CC. And depending on your direction, you can even take less damage from it. It is quite expertly layered to allow for counterplay. I do take an issue with the activation effect of his trait; it feels unneeded. 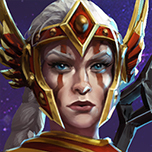 Unlike Yrel, who cannot exist without her instant casts, Rakanoth can survive just fine without it, and since you only have two abilities to choice between, it's not that interesting. It also adds way too much to your trait, which is already overfilled. Yeah, I had this sort of question in the back of my head of "Does this work better as a talent? Is it needed?". Personally, I'd probably do the talent, but I'm not wholly committed to that choice at all with this one. It also adds way too much to your trait, which is already overfilled. I would suggest making the effects occur at every 25 Despair, so as to limit the number of effects and levels. Always sort of a worry with this form of trait(a semi-similar design to my Yogg concept, actually...) is "what's a good number for the intervals?". I think... The movement speed slow could be either shifted into a talent or slowly build with Despair baseline with that change, if even kept, if I were to choose one to remove. Yeah, I can tell this part can use some improvements. Certain talents could certainly use some shifts(Blades of Despair gives as much attack speed as Mithril Mace when full... Temporarily. Yeah, bit of bad judgement in terms of execution.). Talents - Other tier 1 talents improved to help compete with Screeching(which I like where its at), try to improve creativity of tier 2(non-priority, not everything can be special, as much as I want it to be), buffs to Blades of Despair especially(namely something like doubling the total bonus, given stages are more spread and will only be somewhat easier to apply..). Does that seem like a good overall sweep? These all are things I needed the feedback for, I'd say, so I don't mind changing quite so much, especially when none of its too major. Changes have been made, including near universal buffs to Despair application, change to Despair stages, Blades of Despair should function as a talent rather than a gag, and a couple of others listed in the changelog. Additionally, a Tal'Darim skin. Because it was just too fitting to not add. I'd say they're distinct enough, and animations, especially with this kit, would end up unique enough that they'd be distinguishable. The Tal'darim skin for Rakanoth might not work, but, I have faith that Rakanoth would be unique enough from Alarak in terms of Silhouette that he'd work. Not to mention Alarak's abilities don't really fit Rakanoth at all. No complaints here. I find the trait very original and (after the latest changes) well put together; his basic abilities, although simple, seem fresh enough, especially after factoring in the trait; and his heroics are fairly unique in how the operate (could draw comparisons to Murky or Anna, but that may be a bit of a stretch, I think). I'm surprised it wasn't brought up before, but I'm not sure the Q's shove is a good idea for this character, considering he's melee and wants to deal as much damage (and more importantly inflict as much despair) as possible to his target/victim. It's a bit like trying to chase someone down with Raynor and shoving them away with your Q. Other than that, I don't find any problems with the way his abilities currently interact with each other. Perfect choice, and very well executed. Cheers. I don't see any problems here, either. There might be slight frustrations here and there, for example if you pick Feast at 7 and your allies burst an enemy down just before they go up a despair level (costing you some potential heal), but nothing major. Firstly, it's great to hear the improvements have been going over well! Always a little worried when I'm given possibilities and then have to decide without a bit of extra input how the changes I envision sound.